It is all too often to hear people say that insurance is not important. 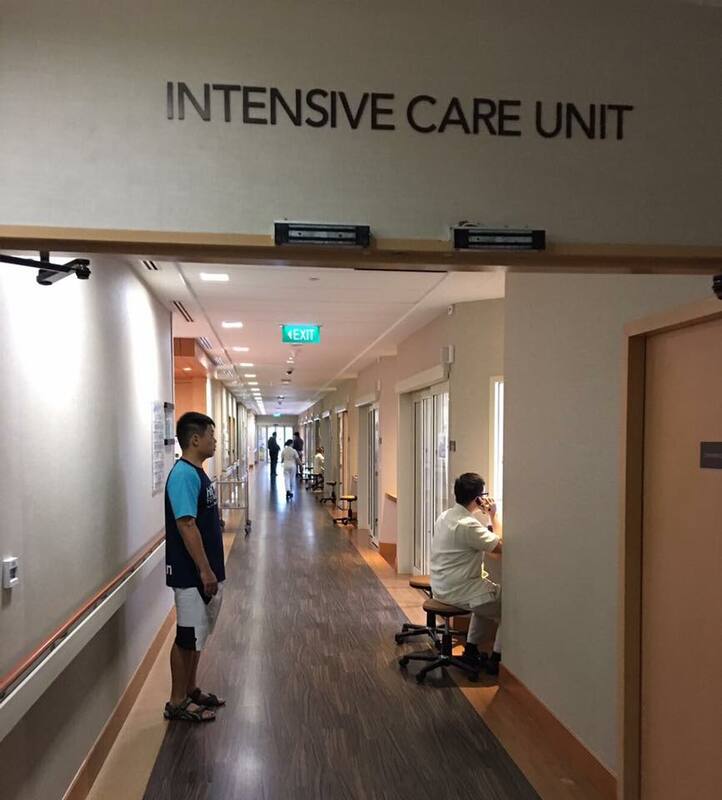 Especially in Singapore, insurance agents and advisers often hear excuses such as there is MediShield insurance, there is medisave, Singapore's healthcare system is the one of the best in the world and government has kept it affordable. But if you get smacked with a medical bill of $1 million like Fina Leong did, you wouldn't be saying the same thing. 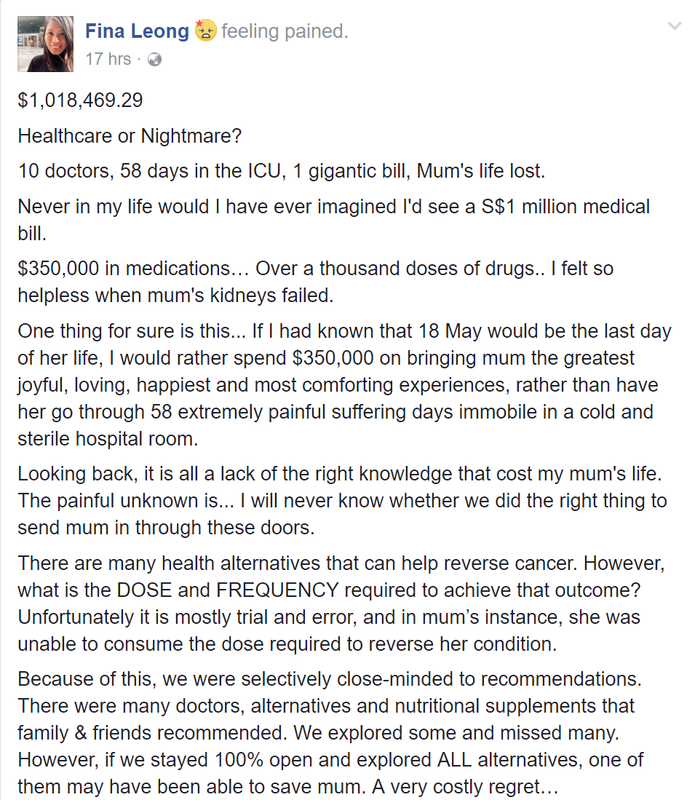 10 doctors, 58 days in the ICU, 1 gigantic bill, Mum's life lost. Never in my life would I have ever imagined I'd see a S$1 million medical bill. 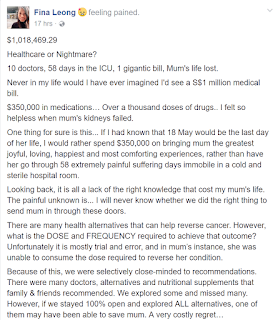 $350,000 in medications… Over a thousand doses of drugs.. I felt so helpless when mum's kidneys failed. One thing for sure is this... If I had known that 18 May would be the last day of her life, I would rather spend $350,000 on bringing mum the greatest joyful, loving, happiest and most comforting experiences, rather than have her go through 58 extremely painful suffering days immobile in a cold and sterile hospital room. Looking back, it is all a lack of the right knowledge that cost my mum's life. The painful unknown is... I will never know whether we did the right thing to send mum in through these doors. There are many health alternatives that can help reverse cancer. However, what is the DOSE and FREQUENCY required to achieve that outcome? Unfortunately it is mostly trial and error, and in mum’s instance, she was unable to consume the dose required to reverse her condition. We didn't realise how urgent cancer was. For someone with a generally healthy diet with natural foods and active lifestyle, if cancer strikes, find out if “targeted chemotherapy” is available. For aggressive treatment as chemotherapy, it needs to be administered as soon as possible while the body still has health reserves and is able to bounce back. We also made the mistake of thinking “all hospitals are the same”. There is a HUGE difference in SPEED and EXPERTISE for public healthcare and private specialists. For a woman over 50's and post-menopause, if there is unusual swelling in the abdomen, a detailed scan to check for tumour is required immediately. When mum was admitted to NTF, the doctors took 2 long weeks to discover the tumour. Something that the right scan would instantly reveal. Unfortunately, I feel that the entire healthcare ecosystem is such that specialists and private facilities are gravely expensive, and billing is structured in a way to max-out insurance payout in a cold and professionally institutionalised way. My heart felt cold when I saw that on mum’s $1 million bill, she was referred to as “Customer” and not “Patient”.. It is truly regretful that we were ignorant about mum’s insurance coverage. Had we known that mum's insurance covered private specialist treatments, we could've sought private specialist expertise from Day 1. More than ever now, I deeply feel that “If you do not invest time, money and energy in your health, you will spend your fortune on sickness”. Ignorance is gravely costly. The right knowledge saves lives and protects families. I hope this post has helped someone out there. May we live with vigour, and die without suffering. This is why everyone should have personal hospitalization and medical insurance coverage.